Long lasting sweatband, designed to be tough and long lasting. Compatible with the EVO 2 Helmet. Absorbent cotton material, prevents perspiration obstructing vision. Heavy-duty industrial browguard with ratchet adjustable head harness and integral chinguard. Adjustable ratchet head harness, providing a secure fit. Integrated chin guard for added protection and comfort. Offers all round protection to the face area and to the sides including the temple area. 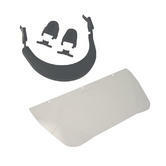 JSP New Avenger Brow & Chin Guard conforms to EN 166:2001. The EVO 3 Comfort Plus helmet combines a super strong shell for superior all day protection in the widest range of environments. JSP EVO 3 comfort benefits of the new unique Evolution 3D Adjustment harness system. The EVO 3 packed full of the latest protection technology and features such as the Revolution Wheel Ratchet which can be adjusted using one hand. Tough HDPE shell proved for EN397 safety standard and meets the EN 50365 Class 0 10KV standard. A 6-point terylene cradle harness system offers unrivalled comfort. PH neutral, dermatologically tested Egyptian cotton core with porous PU coating for maximum sweat absorption Chamlon Sweatband. The EVO3 safety helmet was designed with both performance and comfort in mind. Strong yet lightweight thanks to its HDPE material, it features a 6 Point harness, Sweatband, 3D Precision fitting, One Touch slip ratchet adjustment, and universal slots for Surefit safety visors and ear defenders. The EVO2 safety helmet combines a super strong shell for total protection in the widest range of environments, with the comfort benefits of the new 3D Adjustment harness system. Chamlon Sweatband is an Egyptian cotton core with porous PU coating for maximum sweat absorption. PH neutral, dermatologically tested. Design includes side and rear ventilation reducing heat build-up. 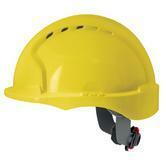 Universal Slots enable firm fitting of a range of Surefit™ safety visors and ear defenders. Disclaimer: please note the images shown are for illustration purposes only; the colours may be subject to changes by the manufacturer. Tough HDPE shell proved far tougher than the EN397 standard required and far tougher than any competitors. Chamlon Sweatband is an Egyptian cotton core with porous PU coating for maximum sweat absorption. This safety helmet is meeting and exceeding the new head protection standard EN14052 - the biggest advance in industrial head protection in over 45 years. 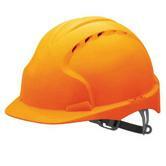 JSP EVO®8 Evolution Safety Helmet conforms to: EN14052 EN50365 Class 0 10KV. This hard cap has reflective piping for extra visibility, excellent ventilation, removable protective liner so the outer cap is fully washable. It also has a unique adjuster for quick fitting, sweat band, and stylish low profile design. Conforms to EN812, and comes in black & hi-vis orange. Easily adjusted to suit the users needs. 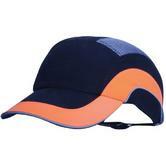 Sporty protective bump cap designed as a safeguard against accidental bumping or scraping of the head. 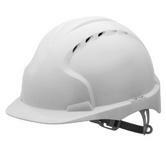 Low dome profile allowing it to be worn with other safety protection items. 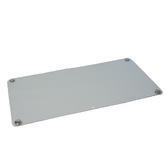 Designed to be compatible with other accessories, low dome profile. 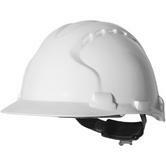 JSP Martcare White Bump Cap conforms to EN812 standard. Wide elasticated chinstrap from JSP, which releases automatically with forces between 150 and 250 Newtons. Meets the requirements of EN397 when fitted to JSP industrial safety helmets; EN812 when fitted to JSP industrial bump caps. Disclaimer: please note the image shown is for illustration purposes only; the colour / design may be subject to changes by the manufacturer. An impact and abrasion resistant polycarbonate spectacle with a modern stylish eyeshield design. JSP Zenith Sodium HC safety spectacles offering excellent wearer comfort over extended periods. Hard coated anti-mist and scratch resistant lens. JSP Zenith Sodium HC Amber Lens Safety Spectacles conforms to EN166 1.F safety standards. Polycarbonate body and lens safety goggles offering protection against high-speed particles up-to 120 m/s (270 mph). These anti-mist goggles comply with the requirements of optical class 1. EN 166 1.B.3.4. 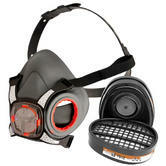 The unique Patent Pending FilterSpec® Pro effortlessly combines both eye & respiratory protection. The 5.5 base one piece polycarbonate lenses offers optimal coverage and class 1 optics whilst ergonomically shaped soft goggle housing provides excellent levels of comfort and unbeatable levels of protection. Anti-Scratch coating as standard. FMP2 filtration giving 94% efficiency. FilterSpec® out exceeds EN1827 for breathing resistance by more than HALF and performs over 3% above the standard for filtration efficiency. Includes white holder, 3 filters and spectacle with Clear HC & Anti-Mist Lens. Stylish goggle design providing impact protection. Fully adjustable dual wide fitting elastic harness for optimum fit & comfort. 5.5 base, one-piece lens offers optimal coverage. Anti-Mist Coating on Lens as standard. Anti-Scratch Coating on Lens as standard. 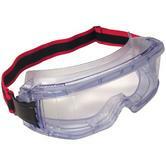 Deluxe anti-mist safety goggles from JSP, with wide angle viewing, and a wide elastic headband for added comfort. Premium safety goggles with clear lens and great wearability, provide eye protection for work and DIY. Moulded-in ventilation for liquid, dust, and hot solid protection. 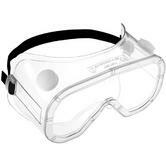 JSP AGN020-441-300 Atlantic IV Anti-Mist Safety Goggles conforms to EN166.1.B.3.4.9 safety standard. This JSP acetate visor is perfect for facial protection. Simple design avoids any unnecessary complications. Protects against flying, abrasive Particles and chemical splash. Contoured to fit headgear or brackets. JSP G-PVA-G5 Green Acetate Visor SH5 conforms to: EN166 1.F.3. Acetate face screen replacement for Invincible carrier. Offers protection against low energy high speed particles at 45 m/s (101 mph) and liquid droplets. 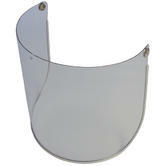 JSP ANA010130000 8" (20cm) Acetate Clear Spare Visor conforms to: EN166.1.F.3 standards. Protect yourself against liquid droplets, molten metal and high-speed particles up to 120 m/s (270 mph) with the JSP visor and helmet carrier. 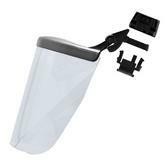 This 20cm polycarbonate visor conforms to EN166 1.B.3.9. Full-face visor and carrier for use with JSP EVO helmet range. Replacement visor for Invincible Chin guard unbound. Provides exceptional protection against high speed particles. Class one optical qualities, granting excellent performance. Easy to attach and set up visor. Used for Evolution Hard Hats. KIt for adding a polycarbonate retractable eyeshield with a clear lens toEVOLite® / EVO3 helmet. Easy assembly into any Evolution hard hat. Retracts into helmet shell when not in use. Polycarbonate lenses block 99.99% of the sun's ultraviolet rays. 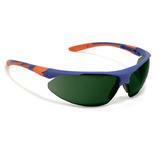 This ultraviolet protection has already been incorporated within the lens material when the lenses are being produced. 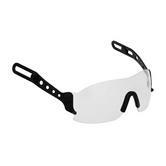 JSP EVOSpec Safety Eyewear conforms to: EN166.1.FT N 2-1.2. 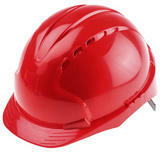 The Upper body welding helmet 802 Series is manufactured by JSP. The product complies to EN 166, EN 169, EN 175 standards. The product comes with a fibre glass hand shield that measures 108mm x 83mm. 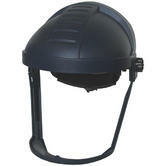 Helmet Mounted Ear Defenders to fit MK7® & EVO® range Helmets. Detachable spring-loaded arms give an excellent fit. Designed for long term comfort and increased protection. 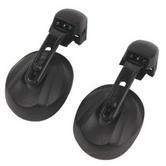 Easy to attach and detach with spring loaded arms that give an excellent fit to the ear. When not in use the arms allow the cups to stand off clearly from the head. Materials: Polystyrene Cups, Nylon Arms & PVC Covered Foam. JSP Contour Helmet Mounted Ear Defenders conforms to: EN352-3 SNR=26dB standards. A premium quality ear defenders, suitable for use in medium duty industrial applications offering proper safety and correct hearing protection. Large foam filled cups offer excellent attenuation, wide soft foam cushions for all day comfort - ideal for long shifts. JSP AEA060-40-500 Big Blue Ear Defender Headband conform to: EN 352-1 H=33 dB M=27 dB L=16 dB SNR=26 dB. Unique retro styled reflective tape for improved wearer visibility. Fully adjustable cradle suspension providing a secure and comfortable fit. Manufactured with a moulded nose for improved glasses and goggles compatibility. Very simple setup, requires very little maintenance. Maxi Mask 2000 Half Mask Respirator comes with 2 x A1 Filters for Organic Vapours and Gases, and P2 Pre-Filters for 94% dust protection. JSP are the UK leaders in above the neck PPE. JSP is an award winning, family business, based in Oxford. Established over 60 years, the JSP range is a good blend of value and innovation in moulded products. JSP now has an extensive range of PPE: ranging from Head Protection - Eye and Face Protection, Hearing Protection and Respiratory Protection. They have a range of different price points: Retail Range, such as the Martcare Essentials - Body PPE, as well as specialist. PPE for Working At Heights. JSP also make extensive amounts of road Traffic Management barriers and more recently road Spill Management equipment.